Video shows deputies moving in to arrest suspect, Jessica Willey reports. HOUSTON, Texas (KTRK) -- The man wanted in a bloody crime spree that spanned across northeast Harris County has been arrested. Russell Cormier, 53, is charged with killing his ex-wife Fannie McWhite. He is also suspected of killing Thornton Jack Bivens, and then shooting his neighbor Roshal Barley. Deputies told ABC13 that the Gulf Coast Violent Offenders Task Force captured Cormier overnight. Sources said that Cormier was found sleeping under a park slide at Gaston and Highway 59. He was not armed. Surveillance video released of police closing in on double murder suspect. Eyewitness News filmed Cormier in the deputy vehicle on his way to the Harris County Jail. He waved at our photographer as he covered his face. Cormier was last seen at 4:30 a.m. Tuesday, moments after allegedly shooting his neighbor, then driving off in a Dodge Stratus. 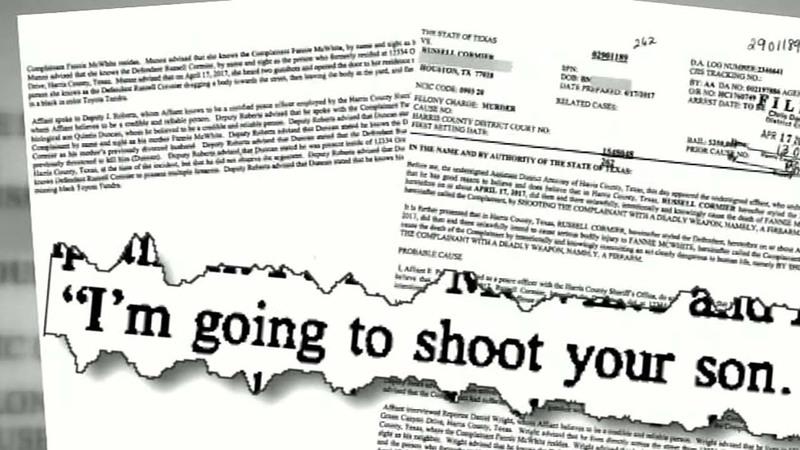 "I'm going to shoot your son," the document alleges Cormier said. Russell Cormier is accused of killing his ex-wife, another man and shooting his neighbor. According to the documents, she replied "no, no," to which he asked, "Well, how do you like this?" Moments later, she was shot. Documents also show McWhite's adult son, who was home at the time, told authorities he had been threatened by Cormier in the past. New charging documents revealed that on Monday, a neighbor heard Cormier threaten McWhite. The man wanted in a bloody crime spree that spanned across northeast Harris County continues to elude law enforcement. Cormier is accused of murdering his ex-wife at approximately 6 a.m. on Monday in the 12300 block of Greencanyon Drive. Authorities said that Cormier fled McWhite's residence in a black Toyota Tundra pickup and drove back to his residence in the 600 block of Shotwell in northeast Houston. There, officials said he collected some belongings and set the trailer on fire. Man wanted for killing ex-wife is still on the run in Harris County, Tracy Clemons reports. Cormier then drove to a business located in the 12200 block of Kindred Street, where investigators say he waited for 60-year-old Thorton Jack Bivens and fatally shot him as he drove up to report for work. Late Monday evening, Cormier's black Toyota Tundra was found abandoned on Wallisville Road. On Tuesday at around 4:30 a.m., officials say Cormier returned to a neighbor's home on Shotwell Street and confronted a man who lived in the home. Cormier allegedly fired into the SUV, leaving shotgun holes all over the vehicle and hitting Barley several times. Barley is expected to survive.